I've gone and added another project to my list for 2011. Can you really blame me for falling in love with this awesomeness? And that's only the middle block of Erin Russek's "My Tweets" BOM. I don't even remember how I cam across Erin's blog but I'm glad I did. 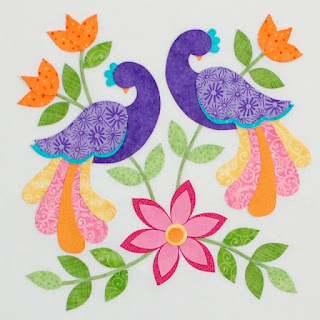 She has a wealth of information on applique, lots of eye candy, and lots of free patterns. Did I mention that she is offering up "My Tweets" for FREE? Well, you do have to buy the middle block from her etsy shop for a mere $10, but blocks 1-12 will be offered on her blog absolutely free! How can you not join in? Her amazing patterns would easily be sold for $10 a piece putting you at $130 just for the patterns. How can you pass up this great quilt pattern for only $10? Erin already has block 1 up and ready for download. I already cut out all of my freezer paper pieces for the left bird but right after I did I realized I didn't reverse the image. doh! Luckily the birds are pretty much the same size so I'll be using the the pieces for the right bird. I'm not very good at handwork, well actually I'm pretty good at it but it takes me forever and I usually loose interest midway into a project. 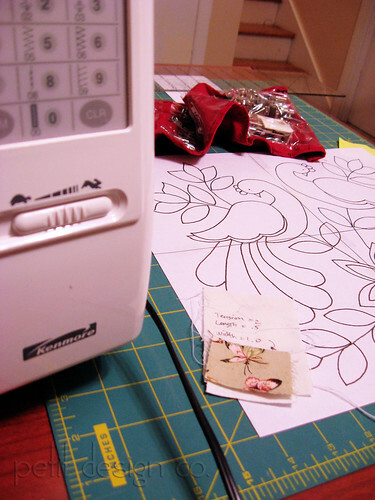 So I'll be doing invisible machine applique to speed me up. This morning I realized that I should really be using the washable fusible I got for the Joseph's Coat quilt to make things easier. Good thing I realized this at block 1 and not at block 10! 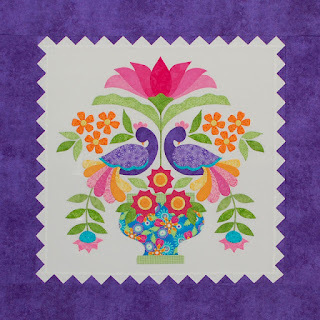 This will be my first BOM and applique project. Hopefully I won't loose steam because this is going to be a lovely quilt. All "My Tweets" images are copyright Erin Russek and were used with permission. These blocks are beautiful!! I'm excited to see your progress with these. They are just lovely. Thank you for sharing the tip on the pattern.. I may just have to go check those out as well. That is very pretty. Will you be using similar colors? Hey is that speed control on your machine pushed all the way over to "rabbit/hare"?? ?